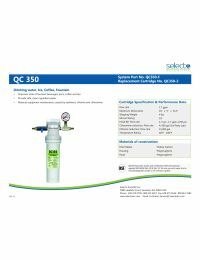 The Selecto QC350-F Fountain Use Filtration System is designed to reduce chloramine, chlorine, taste, odor, and cysts in fountain beverage, juice, coffee, and tea applications. The QC350-F housing is constructed of polypropylene, and utilizes hollow carbon filter media to provide a flow rate of 1.7 gallons per minute. The replacement cartridge for the QC350-F is the QC350-2.